British Airways inflight entertainment system is called Omnia, and is pretty standard across the fleet. 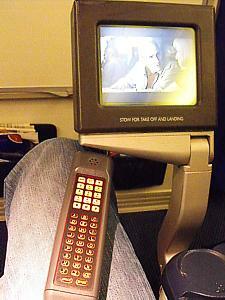 All longhaul British Airways aircraft feature seatback TV screens. 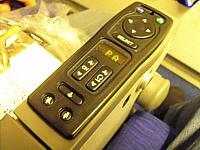 On most planes including almost all 747s, there is AVOD, or Audio Video on demand. On planes without AVOD there are 18 video channels in economy, WTP and above, plus a moving map, and 16 radio channels (which noone listens to, but which are quite good. There is even a dedicated business radio channel). They are, alas, all mono. 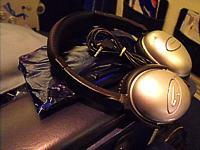 There are however now noise reducing headsets in First. 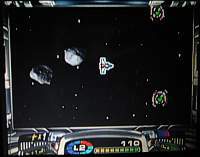 If you travel in any cabin other than basic economy (so that means World Traveller Plus and above) there are video games you can play. They are pretty basic and slow loading, but there are 20 or so to try. Most seatback video screens are a good 4 inches across, WTP bulkhead seats are 5 inches, Club World comes in at 7. If you watch the skymap as you enter or leave London, Stansted appears to be 40 miles out of position. This is actually a small village in Kent - not the UK's third largest airport. It appeared on the maps for years, and was well commented on by passegers, before being noted in the media as an error, although it's believed that the creator of the map was unaware of the significance. 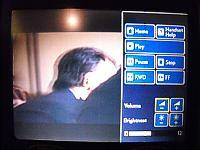 There are three different entertainment products on British Airways flights. 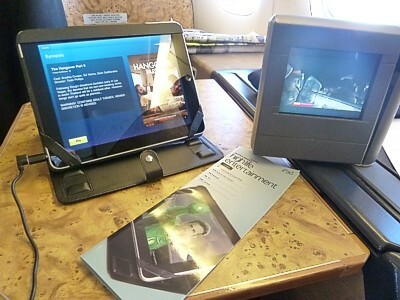 There is a Mainscreen offering with overhead TV, Seatback video on longhaul flights in all classes, and AVOD or Audio Video on demand on most modern aircraft. There is no entertainment on most European flights, except for those in Band 4 (such as to Athens, Moscow, Tel Aviv & Istanbul). For these longer band 4 flights films are shown on the overhead TVs after a run of the BBC News and Bloomberg's business update. Beware though that if you sit in the front row of the 767 you will have to squint at a tiny screen only 2 inches across. 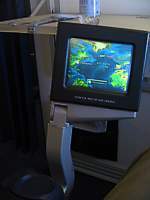 On lounghaul flights with just normal seatback video, the entertainment system starts off as soon as the plane has reached cruising altitude. Then on channel 1 there is BBC World News, which is a dedicated version just for BA, 20 minutes long, and which is very good. It is sent from TV Centre to LHR at 10.45am every morning - so catch a flight before midday, and you'll watch yesterdays news. Meanwhile on channel 2 there is a 10 minute trailer which runs through most of the other film offerings. The films then start after 20 minutes, and the cycle then repeats itself at 10 minutes after the duration of the longest film - you can find out what it is from the length of films in the inflight magazine. Before the films start you get a one minute countdown on the screen. On most modern planes including almost all 747s, there is AVOD, or Audio Video on demand, where you can select from a dozen or so short films plus 30 or so comedies and short documentaries. You can stop and start these on demand. There is only a small controller in the armrest that can cycle through the mainstream films on a loop if you wish, otherwise you press the screen itself which has a pop up box with play, rewind and fast forward buttons. To see the moving map you have to exit out of the film, but if you then reenter it, it will ask if you want to continue where you left off, or start from the beginning. Finally, in First Class, if you are stuck in Old First, BA's IFE system has gone through many iterations, and has now settles on iPads as a short term stop gap. Here, you'll get an iPad loaded with half a dozen current films, and a few older ones, plus some TV programmes. There isn't much quantity loaded onto the iPads, but it's better than the old IFE with a 4 inch screen. First Class BA iPad IFE, beside the old TV screen. Headphones vary according to class. In economy you get very basic headsets with an overhead band and a 3.5mm jack. 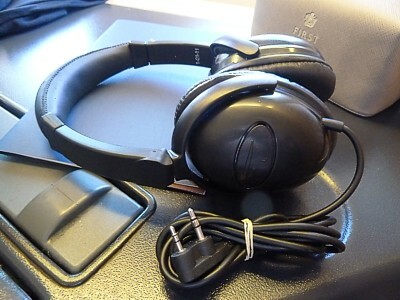 In World Traveller Plus there are BA's famous "enhanced" headsets, which are actually more comfortable headphones than those in basic economy, with much bigger cans, even if the audio playback is the same. Again, they use a 3.5mm jack. 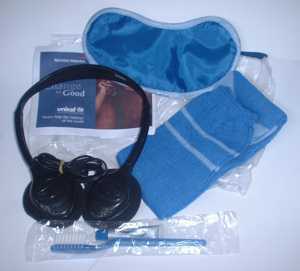 In Business and First Class you will get decent noise reducing headphones, which are very good. British Airways in flight entertainment content is very good indeed, with mostly first run movies, and some older films from the past couple of years. Much of it is UK centric - which is no bad thing - so you may get the chance to see some British films you've missed. 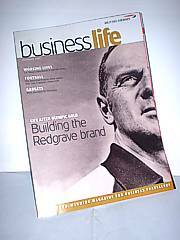 British Airway's inflight magazine is called Highlife - and claims to sets the standard by which others hope to achieve. The marketing is subtle, the articles on travelling are interesting, and it will keep you going for at least a couple of hours when you're bored of the inflight films: or indeed when you are flying around Europe, where there are none. There's always a good guide on BA's fleet news, the routemaps actually bear some relation to the flight path you will take, and normally you'll find a featured pilot once a month describing the approaches he likes. It comes out once a month, and will always reliably be in your seatback pocket, as well as the lounges. It also doubles up as the inflight film listings, which are sensibly laid out, at the back of the mag. Because BA has three different inflight entertainment systems, you have to check if you have an overhead, the 8 or 12 channel system, or AVOD, and then go to the section for that - then see the twin pages for flights to or from the UK. The overhead system is called, logically enough, Mainscreen, and is now only on 757s (to Athens and Moscow) and the ancient 767s (to Tel Aviv and Detroit). 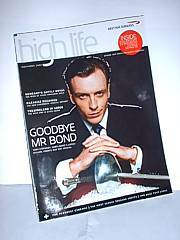 There used to be variants of the magazine according to which TV system you had: no longer - you'll have to check the design of the remote, and marry that up to the type of plane you are on, and finally, you get the grid of film listings. In First Class there was another variant of the magazine, called "First View", which listed all the DVDs in the video library, but again this is no longer there. In Club (Business) and WTP, plus occasionally the seats in 737s which are interchangeable between classes, theres an unusual offshoot - Business Life. 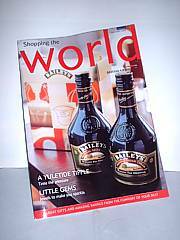 It is generally well laid out but a bit dull, particularly the interview with Chief Execs of large companies, and articles on doing business abroad, but theres a good "how to spend it" section on how to waste your cash on loads of toys, and a pretty decent section on good business hotels. There's yet another magazine taking up the seatback pocket (which is often so jammed you can't get any wine bottles in. Shopping the world give 60 pages of shopping - and some of it is pretty good. You'll also get miles on your Executive Club card if you shop in the air. There are the usual duty-frees (priced at about half way between duty free on the ground and real world prices), perfume, watches, and some electronic toys. Alas anything outside the ordinary is unlikely to be carried on planes other than big 747s.